When it was first recognized by the Centers for Disease Control and Prevention in 1981, AIDS was nearly synonymous with a death sentence. Luckily, in the decades since, the advent of modern medicine has transformed the disease from an untreatable ailment to a "chronic condition." But despite the significant advances in the life-saving drug therapies that are now available to HIV/AIDS patients, a new CDC report shows that nearly half of HIV positive gay and bisexual men aren't receiving the proper medication, and only 42 percent of those on treatment have successfully suppressed HIV levels to undetectable levels. Considering that gay and bisexual men make up the majority of Americans with HIV, this suggests that a large portion of HIV positive Americans are not taking drugs that could save their lives. In fact, the 2 percent of Americans who identify as gay or bisexual make up 66 percent of all new HIV infections. Though the rate of infection amongst every other demographic is decreasing, it remains on the incline for gay and bisexual men, and a study in the journal Aids and Behavior estimates that at the current rate of infection, half of all gay and bisexual American men will have the virus by the time they are 50. But according to another study released Thursday by the Kaiser Family Foundation, only 30 percent of these men are aware of this trend. A similar number have never been tested for the virus, and yet another third haven't been tested in at least a year. The CDC recommends being HIV/AIDS tested every three to six months. The CDC's own study on treatment, published Thursday in the Morbidity and Mortality Weekly Report, examined 2010 data on over 400,000 gay and bisexual American men who tested positive for HIV. Researchers found that while three-quarters of them received the proper medical attention within the first three months, only half of them continued being treated regularly, which is necessary to keep the virus in check. This means that only four out of every 10 gay or bisexual men with HIV/AIDS have the disease under control, and it seems that the majority of them are white and affluent enough to afford the constant treatment. Most of them also tend to be much older. 68 percent of HIV positive gay and bisexual men over the age of 55 were on treatment therapies, but only 30.5 percent of those between the ages of 18 to 24 could say the same. From 2001 to 2011, doctors saw an increase of 132.5 percent in HIV positive diagnoses in 13 to 24-year-old men. Moreover, 83 percent of white gay or bisexual men successfully obtained treatment after their diagnosis, compared to only 72 percent of black men. Yet men from racial and ethnic minority backgrounds were far more likely to be personally affected by the disease, with 64 percent of minority men saying it was a significant issue for them personally. Only 42 percent of white men said the same. Similarly, more minority men said they were concerned about HIV/AIDS than their white counterparts, with 53 percent of minority men citing worries, and only 28 percent of white men agreeing. 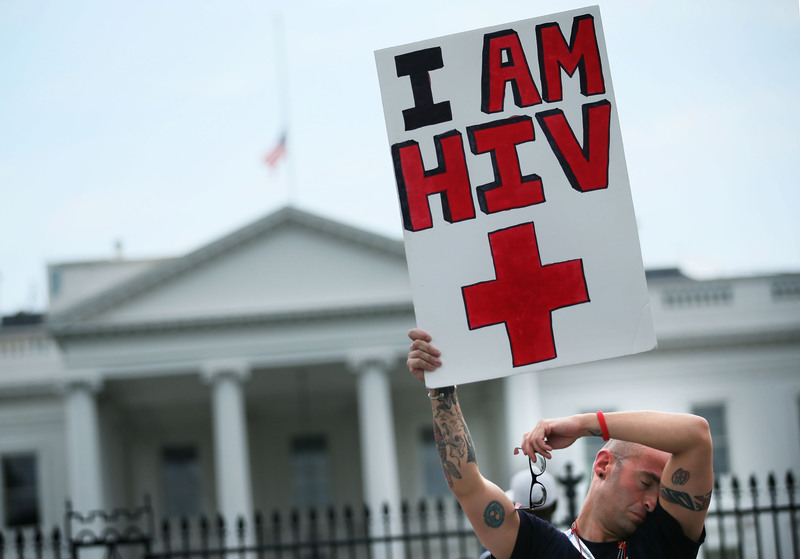 For the most part, however, gay and bisexual men in the United States simply aren't perturbed by HIV/AIDS. 56 percent of the 431 men Kaiser surveyed said they weren't too concerned or concerned at all about HIV. The same percentage said that a doctor had never recommended that they be tested. This comes in spite of the fact that the CDC found that "in 2011, the National HIV Behavioral Surveillance System in 20 cities found that only 49 percent of [gay and bisexual men] aged 18-24 years who tested positive were aware of their HIV infection." This was particularly true for young black and Hispanic men. Worse yet, an overwhelming 80 percent of them said they had never heard of PrEP or Truvada, a revolutionary daily pill that is about 90 percent effective at preventing HIV infection. Much of this unawareness stems from the continued social stigma that seems to surround HIV/AIDS. Paige Rawl, who was born with HIV, told Vox, "[My soccer] coach made a joke to my mom that the team could use my HIV status to our advantage, because the players on the other team would be scared to touch me, and I could score goals." And for gay men, the stigma is even worse. The CDC survey cited "lack of health insurance, stigma and discrimination" as a few of the major factors preventing many men from obtaining the proper treatment for the virus. And these findings have convinced doctors and researchers of the distinct "need for continued expansion of prevention, care and treatment efforts." We’ve gone full bore on this, and shifted our HIV prevention strategies to reflect the increasing evidence of the dramatic impact that treatment can have on prevention. It’s very high on our radar. In keeping with these promises, last week, the CDC unveiled its “HIV Treatment Works” campaign, an educational program about best practices for treatment, as well as “Start Talking Stop HIV” effort aimed specifically at gay and bisexual men, which urges them to have open dialogues about HIV and get tested regularly.